0: Avenger loses -1/-1 and gains one of your choice of flying, banding, first strike, or trample until end of turn. Attribute losses and ability gains are cumulative. 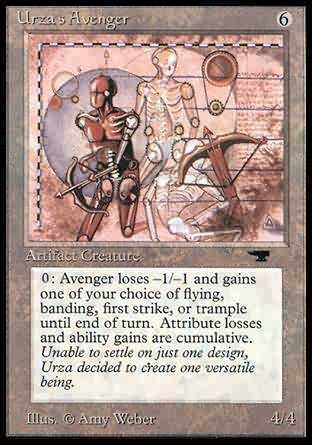 0: Urza's Avenger gets -1/-1 and gains your choice of banding, flying, first strike, or trample until end of turn. Unable to settle on just one design, Urza decided to create one versatile being.